LaunchStar software lets team members work individually – without the internet – and later synchronize with teammates via the cloud. It has an intuitive interface that allows individual users to access all the reports, project management aids and launch tools without ever leaving the home screen. Best of all, the software helps users launch their new product in an easy, repeatable, and dynamic way. Navigation is easy: You never lose sight of the home screen buttons. 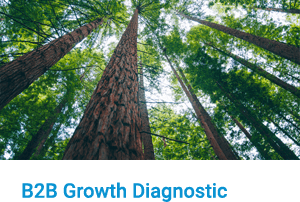 Your team plans its work activities, and record results against metrics after launch. A helpful overlay guides you through the software and gives you tips along the way. Executive Summary: Tell management and anyone else your launch story in a single 2-page document. Prospect Profile: Describe target prospects to ad agencies with crystal clarity… including target job functions. Message Brief: Don’t pay your ad agency to guess at the right message: Hand it to them in incredible detail. 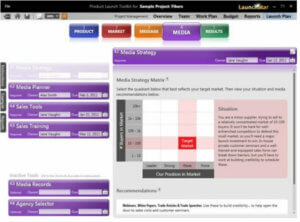 Media Guide: Use powerful LaunchStar tools to create a media strategy…and document it here for a media blitz. 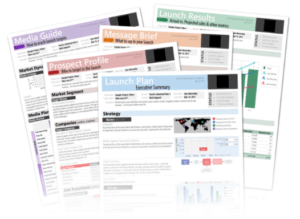 Launch Results: After launch, track success for up to 5 years. Apply what you’ve learned to plan future launches. Customized Reports: Assemble your own reports to communicate with the sales force, customer service, etc. 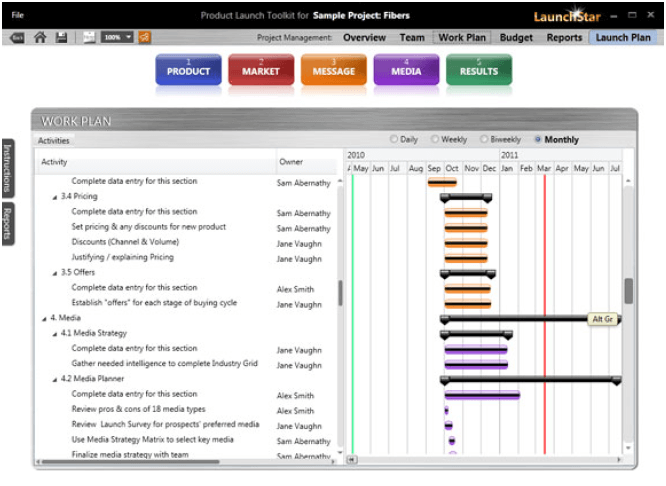 Begin with a pre-populated Gantt chart full of key launch tasks… and then modify to meet your needs. An advanced budgeting tool helps you itemize how much you’ll spend and when you’ll spend it. 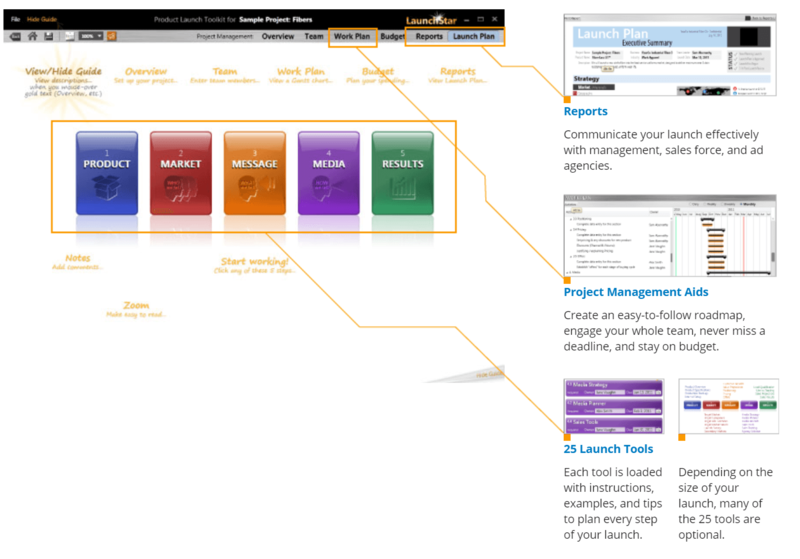 25 Launch tools are grouped logically under 5 steps. 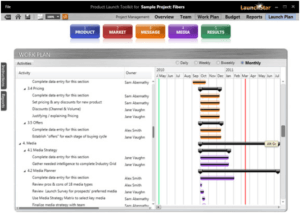 When you open a tool to work, you can see at a glance who “owns” the task and its due date. You won’t do more work than you need to: Depending upon the size of your launch, many tools are optional. 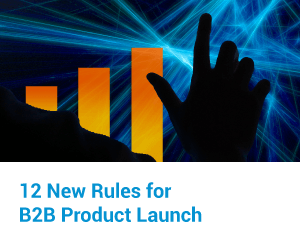 Tools are loaded with instructions, examples, and exciting up-to-date B2B launch techniques. 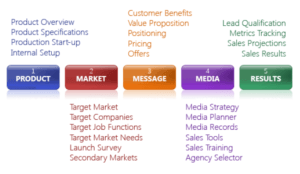 Many of these powerful tools include techniques not found elsewhere… such as the two-question launch survey for understanding the best way to promote in your target market. What do our clients rave about the most? The planning tool for selecting the right promotional methods from 9 traditional and 9 online possibilities. Want to check out this cloud-based software for your company? Just contact us to set up a free trial.